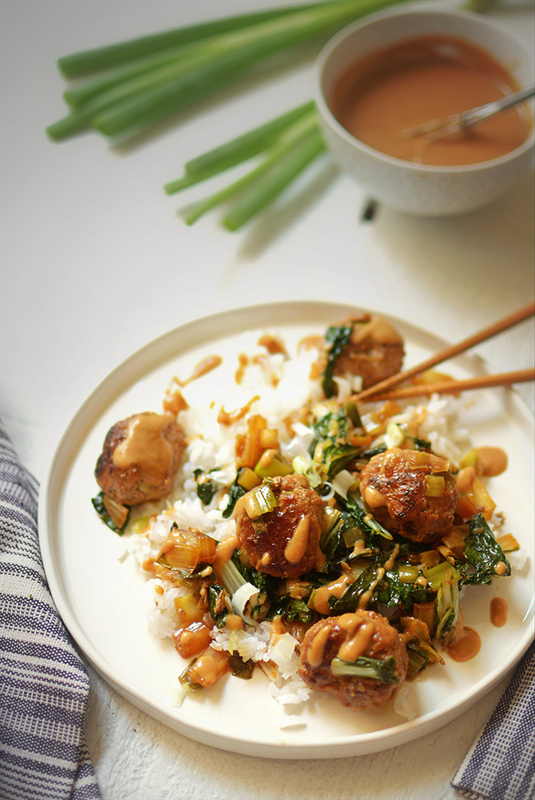 One-Pot Asian Meatballs with Bok Choy and Peanut Sauce – This sweet and savory Asian-inspired dish with hints of ginger and green onion will be a tasty, fun hit with the whole family! 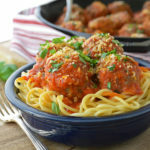 Meatballs are one of the few foods that always go over well with everyone in my home. 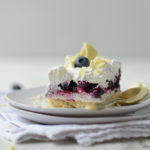 With two boys (and a husband) I think the guys in my life like the idea of a food that looks like they should be throwing it. 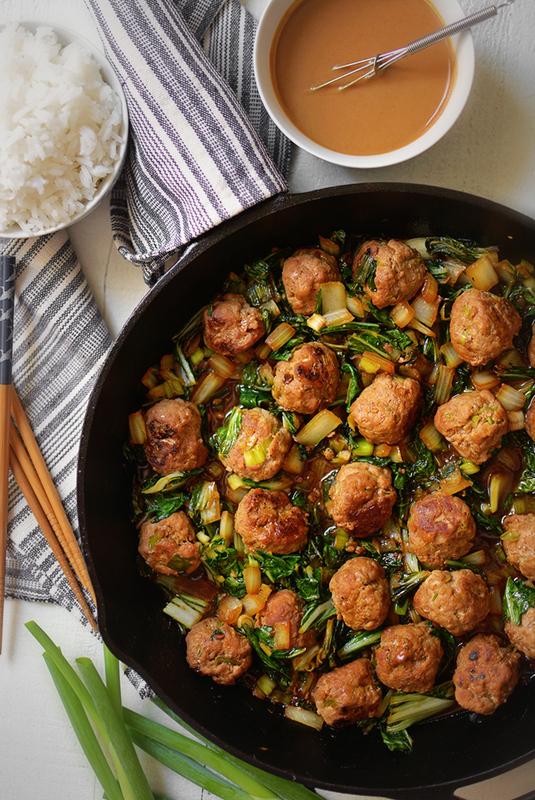 Today’s recipe for One-Pot Asian Meatballs with Bok Choy and Peanut Sauce was an obvious hit in my home. Aside from looking like the perfect dinner time projectile, my Asian pork meatballs taste amazing. 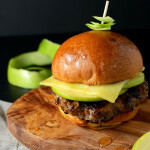 The have a sweet and savory thing going on with hints of ginger and green onion. The sauce that they’re cooked in is so tasty that it even got my kids to eat their bok choy. Surprisingly, when I make this meal, more dinner ends up in their bellies than on my poor, sticky kitchen floor! Mix together the meatball ingredients and roll the mixture into meatballs. 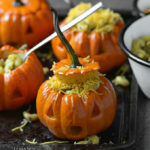 Place them on a skillet that has been oiled with 1 Tbsp of vegetable oil. Each meatball should be made of about 1 Tbsp of meat and you should end up with approximately 25 meatballs. Cook over medium heat for 2-3 minutes on each side. 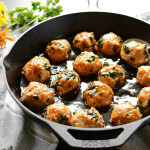 Once the meatballs are cooked through, remove the them from the skillet and set aside. 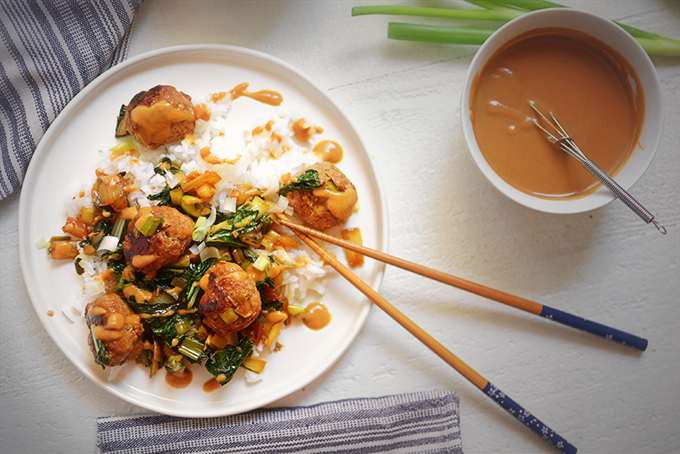 While the meatballs are cooking, make the peanut sauce. 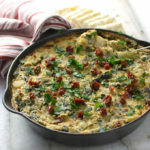 Simply whisk together the ingredients and set aside to serve with the meal later. Once the meatballs are done cooking, drain off the excess fat from the skillet but leave some of the meat drippings and a light coating of oil in the pan. 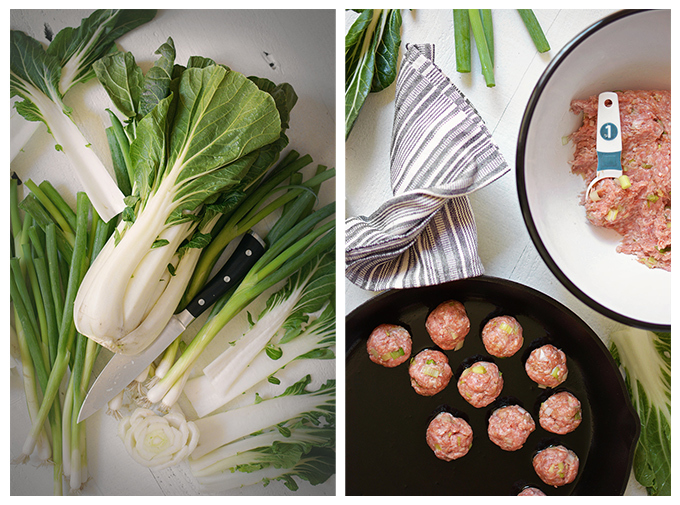 Add the bok choy stems to the skillet and sauté for 4 minutes. Next add the bok choy leaves, as well as the green onion and garlic and sauté for two more minutes. 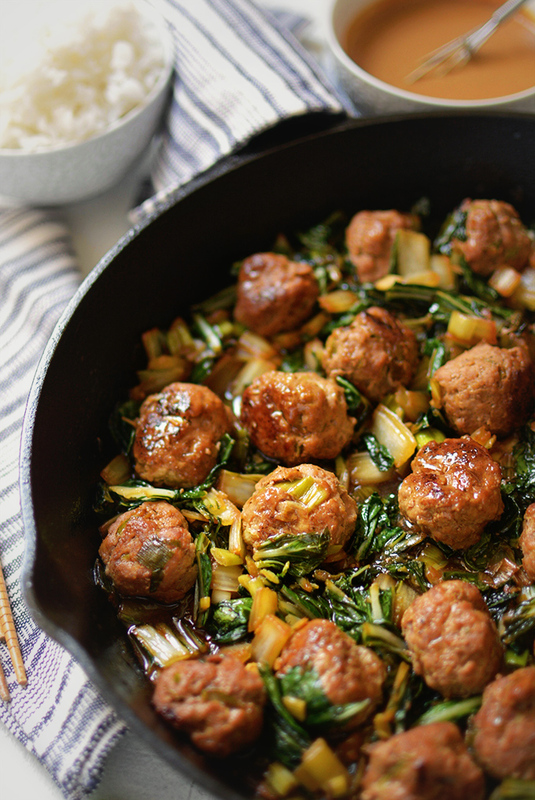 Add the meatballs back into the skillet. *Chop about 3 C stems, and 5 C of coarsely chopped bok choy leaves. 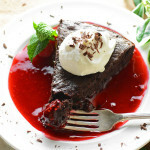 **Serve as is for a low carb option, or serve on a bed of rice. 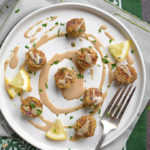 The recipe produces 5 servings of approximately 5 meatballs. I had to LOL while I read your post Rachel! My husband an I raised 4 sons, and we now have 2 grandsons (no girls)! 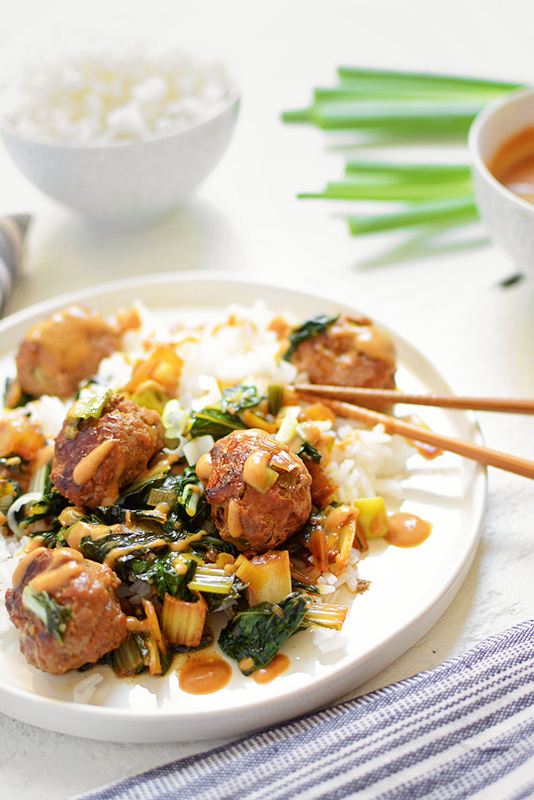 Everything was a projectile, and food fights were common… Your recipe for Asian meatballs with bok choy looks tasty, healthy, and easy to make. I’d say that’s perfect when raising busy boys! Haha! Boys will be boys I suppose! I wouldn’t trade mine in any day! That peanut sauce looks de-lish! 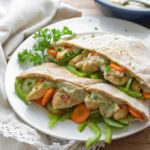 Peanut sauce is one of my favs! We really enjoyed this, the sweet/salty balance is good. We did add a little Sriracha for heat.